Gas fireplaces and inserts can heat your whole house. Check out these top brands to keep you warm in winter. This fireplace insert is easy to install and will improve the ambience whilst adding efficient heat to any room. This dual option gas heater operates on natural or propane gas and can heat rooms up to 1320 square feet. 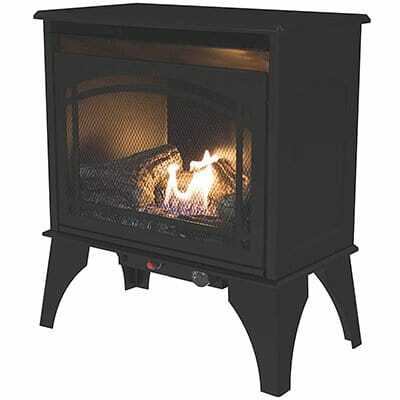 This freestanding gas heater operates on natural or propane gas and can heat rooms up to 700 square feet. It’s winter time again, and that means snow…and slush…and sleet…and cold. Terrible, frigid, downright nasty cold. Keeping your home warm and comfortable through the winter months can certainly be one of the biggest factors regarding your total energy budget for the year. Many smart homeowners have gone to using a zone heating strategy to keep their costs down. Gas units (particularly natural gas) can burn with an efficiency of up to 97% while wood burning units top out at around 70%, meaning more heat being directed to your room than up the chimney and vented to the outside. With zone heating, you can set your main heating system’s operating temperature lower, and then use supplemental sources to generate extra heat just in the rooms that you reside in the most often. A gas fireplace and/or insert is just the right option for giving you the heat you need while adding spark and flair to your bedroom, living room, or family room. We have compared the best gas fireplaces currently available on the market. All types, including freestanding stoves, wall mounted units, and inserts are covered and great detail. Before we get to the list, however, let’s take a look at several factors that will ultimately influence your purchasing decision. Units that are designed to be freestanding stoves replicate the look, style, and functionality of a true wood burning stove. The log sets inside (over the gas burner) have gotten to the point where they look so real that many people would have a hard time telling the different. They give you the benefits and convenience of gas operation (they come in natural gas or propane models) that wood-fired units simply cannot compete against. Heating levels can be accurately monitored and adjusted and you don’t have to mess and fuss around with keeping it loaded with wood that gets dirt and debris all over your room. Wall mounted gas fireplaces add a contemporary look to any room. Most (if not all) of the units we have come across are ventless (more on ventilation options later on) due to the nature of how they are intended to work. This is due to most of the fireplace body being actually in the wall structure. While very attractive, the installation can be more intensive than other units. For the most part they are placed flush into the wall and not simply hung on wall anchors as many electric fireplace units are. If you already have an existing actual fireplace in your home then a gas fireplace insert would most likely be your best option. A gas line would have to be run up to the firebox but, short of burning a real wood fire, you will get more heat and the realism as compared to an electric fireplace insert. Many people have a beautiful fireplace already but have decided to stop using it. They have gotten tired of the hassle, maintenance, and mess that comes with burning a wood fire (whether it is just for ambience or to help with supplemental one heating). These units are commonly referred to as “gas logs”. They are somewhat of a hybrid between a freestanding unit and an insert in that they are intended for installation within an existing fireplace. Log sets are not placed in an enclosure with a blower fan as a traditional fireplace insert is so you must consider you usage plan when evaluating these units. In regards to venting options (again, to be discussed below), there are log sets designed for both vented and ventless applications. As with an insert, a gas line will have to be run up to the firebox to enable the installation. Outdoor log sets are available as well if you want to add some spark (no pun intended) to your deck or outdoor entertainment area; it may help to warm you up as well when the colder weather starts to draw in. Gas fireplace units normally come in one of two different options for ventilation: vented and ventless. Vented units are designed to work the same as wood fireplaces in that they have to be installed with a chimney or flue that will vent dangerous gases (created by the combustion process) to the outside atmosphere. Ventless units still have a real fire produced by a gas burner, but they are designed so a working chimney isn’t required (therefore leaving more heat in the room). They burn much cleaner and complete than a vented gas unit, and the flames are set where they aren’t as high and visually appealing. Note: this is just a general overview; we will go into further detail later on. 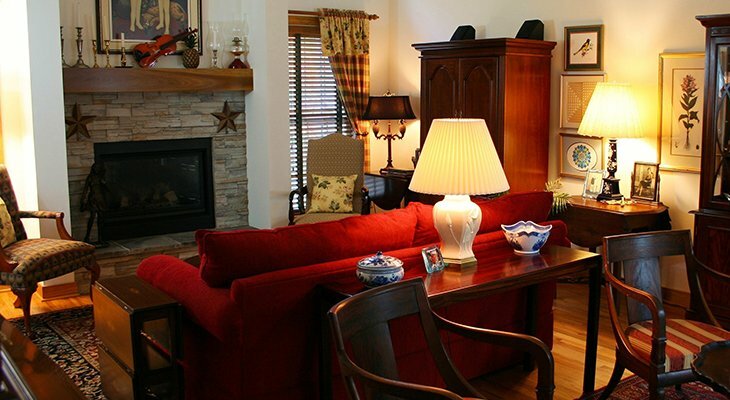 Where to put a gas fireplace heater can be somewhat limiting. Vented units will have a more permanent installation due to the need for a working chimney, inserts are limited because they have to go into an existing fireplace, and wall mounted units are…well…put into big holes in the wall! Ventless freestanding units don’t get away with much here either because ALL of these units need to have a hard gas line professionally installed; it’s not like an electric unit where you can just unplug and move them around as needed. From a safety standpoint it’s important to remember that gas fireplaces have a much higher heating capacity than an electric unit, so they must not be placed next to anything that has a danger of catching fire. When considering any type of gas fireplace, you will see the heating capacity rated in terms of “BTU’s”. BTU is an acronym for British Thermal Units, and it is a measure of the amount of how much is needed to raise the temperature of a pound of water one-degree Fahrenheit. Gas stoves, due to the actual combustion process, will produce much more heat than a typical electric fireplace unit. For comparison, many gas units have a capacity upwards of 20,000 BTU’s while electric units are normally maxed out at around 5,000 BTU’s due to how they are designed to be safely operated. Both vented and ventless options for gas fireplaces are considered to be much more efficient than a wood burning unit. While a vented unit does have heat escape up the chimney, the ratio is much less than with a wood fire. They burn cleaner and tend to use much less fuel. Ventless units are even better as all of the heat remains in the room. That is similar to the effectiveness of an electric fireplace but the big different with a gas unit is the available heat output is much greater. Gas fireplace heaters offer all of the visual pizzazz that any traditional wood fireplace has. In the past the log sets and flames may not have been too convincing, but over time designs and manufacturing capability have gotten to the point where, at first glance, it can be hard to tell that you aren’t looking at a real wood fire. The inconsistency of the flame pattern and catching a hit of wood smoke aroma are part of what makes a wood fire attractive but gas fireplace units are much easier to use and maintain for the long term. Unlike electric fireplace units where the size of the room can be a limiting factor to heating capacity, a gas fireplace is probably your best bet when it comes to heating ability. The BTU ratings are much greater, allowing for a greater area to be heated. Wood fireplaces in particular have no real control over the heat other than throwing another log on the fire and letting it burn down, therefore being difficult to control with an even temperature. Gas fireplaces offer much more flexibility in this area. The unit you are looking to buy may have enough heating capacity for the square footage of the room, but other factors need to be taken into account. Is the room well insulated? Can you feel drafts by the windows or close to any door openings? Poor insulation will add to your operating costs as a good portion of your heat will not be used efficiently. It’s like when I was a kid and I left the door open; my dad would always say “what are you trying to do – heat the outside?!?”. He certainly had a point, and a lack of adequate insulation is pretty much the same thing as throwing a part of your heating budget out the window. Regardless of the type of heating unit you end up with, the height of the ceiling can have a huge effect on how well it heats the room. Heat rises, and having tall ceilings will let the warmth your gas fireplace generates go right up to the top where you can’t enjoy it. Ceiling fans can help to redirect the air but they can have an effect of cooling the air as it moves around. The condition of the flooring needs to be considered as well. Gas fireplaces, if not installed on a sturdy and proper surface, could be prone to extreme safety concerns with the fact that there is a live fire lurking within! Just as electric fireplace heaters have an array of safety features built in, many gas fireplaces have them integrated in as well. Just the very nature of the combustion process makes it so extreme care must be taken for proper use. Flame supervision devices (FSD’s) monitor the presence of a flame. If no flame is present then the gas supply is cut off. Gas – either natural gas or propane – is extremely flammable and can cause explosions if allowed to accumulate in a closed area. Atmospheric Sensing Devices (or ASD’s) monitor the amount of oxygen that is the room. Low oxygen levels are a sign that the gas fire may not be burning properly, therefore potentially causing a release of dangerous gases such as carbon monoxide. When levels are low then the ASD will extinguish the flame. These two systems work together to ensure safety – if the ASD senses that the oxygen levels are too low the flame gets cut, then the FSD cuts off the gas. Externally it is always a good idea to have some sort of carbon monoxide detector in the area where the fireplace is to be used. You can never be too careful! As with any consumer product you will find gas fireplaces and inserts at both ends of the range regarding price and warranty level. The purchase price will be influenced by the overall heating capacity of the unit, the level of quality construction, the type, and other available benefits and features. Don’t be misled by units at either end of the pricing spectrum, however. When considering less expensive units I always think about the phrase “I can’t afford to buy the cheapest unit available”. You may get a break upfront but may pay up and above the price with problems that, unfortunately, may come with an extremely economical fireplace. Conversely, the most expensive units may have comparable feature sets as the mid-range models, so why pay more if you aren’t realizing true benefits from the extra cost? Regarding warranty levels, they can fluctuate widely as well. Some manufacturers can offer complete lifetime coverage while others may only have limited coverage for time periods as low as a year. Gas fireplaces are more of a permanent installation than that of an electric fireplace so keeping warranty considerations in mind is a smart move to make. Room Heating Size (Max) 1,320 sq. 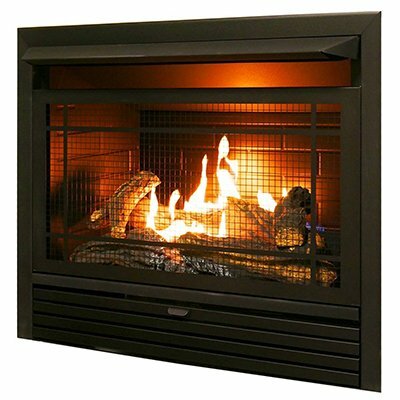 ft.
Our first choice for the best gas fireplace is the Emberglow 43” Convertible Vent-Free Dual Fuel Fireplace. The freestanding design (with an optional mantel conversion kit) will add a touch of style to any living space, while packing enough capacity to heat up to 1,320 sq. ft. It is a “dual fuel” unit which means that it can accommodate the use of either natural gas or propane; this is unique and flexible as most units are designed for either one fuel type or the other due to the differences in how the fuel burns. So, if you are living in a rural area and using propane, you will not have to get another unit when that natural gas line finally comes down your street. It’s ventless so energy efficiency is up to 99.9% – which means much less of your heating budget is going “up in smoke”. A handy thermostat lets you adjust the heating level with ease, and the custom hand-painted logs (coupled with a dual U-shaped burner) give you realistic flame effects to add ambience. Safe operation will never be a worry as the built-in oxygen depletion sensor cuts the unit off if there isn’t enough oxygen in the room, and it also has to two-year limited manufacturer’s warranty. 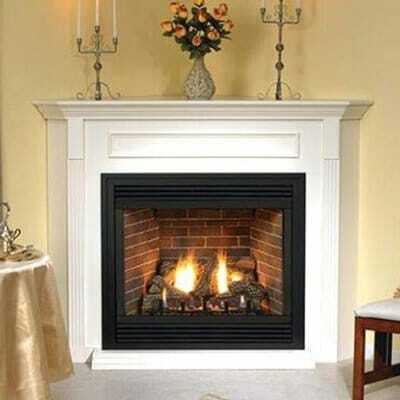 Our choice for the best vent free gas fireplace insert is the Emberglow 32” Vent Free unit. Ventless operation gives you up to 99.9% heating efficiency that works great with larger rooms (up to 1,100 sq. ft.). 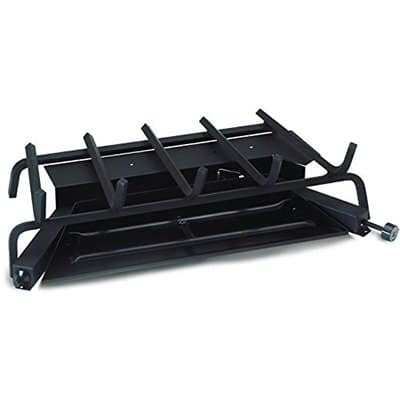 The 32” width is the perfect size for most existing fireboxes, and the flush mounting design gives a sleek appearance. The traditional herringbone firebrick pattern can be finished with other non-combustible materials to add to the elegant appeal. An adjustable screen in front of the unit adds to the realistic look – you may not be able to tell it isn’t a real wood fireplace! It is insulated with a heat deflecting guard to protect you existing mantel, and the sturdy steel construction coupled with a lifetime limited warranty will ensure safe operation for years to come. Room Heating Size (Max) ~ 1300 sq.ft. The best vented gas fireplace that we have come across is the Empire Comfort Systems Premium 36” model. Temperature control couldn’t be easier with a variable speed blower and temperature switch, and with an energy efficiency rating of up to 83% both you and your wallet will never again miss having a wood fire! Realistic flames (due to the vented operation design) and log set, a tempered glass front pane, and herringbone firebrick with accents similar to real smoke patterns add to the elegant visual styling. The corner installation design also helps to maximize the amount of free space in your living area. Warm up your living space while looking good doing it! Do you already have an existing fireplace? Are you tired of the mess that comes from burning wood, but you still want to have that “real fire in the fireplace experience”? If so, then the Peterson Real Fyre 24” Split Oak Designer Plus Log Set is perfect solution. While other styles of gas fireplaces do have their own look and style, there is nothing like a log set to give you the true realism and ambiance that only a real fireplace can. The Peterson Real Fyre has a dual burner system to produce the most realistic flames possible, and the log sets are uniquely detailed (they’re hand painted even!) for a truly authentic look. The large heating capacity of 55,000 BTU’s will be enough to add supplemental heat to just about any living area, and temperature adjustments on the fly couldn’t be easier thanks to a convenient remote control which actuates a safety pilot valve smartly hidden from view. Packaging a great feature set and visual realism that is steps above competing units, the Peterson Real Fyre Log Set is our #1 pick for the best gas fireplace log set available! Propane may not be as efficient overall as natural gas, but if you live in a rural area (as I do) then you may not have another option. 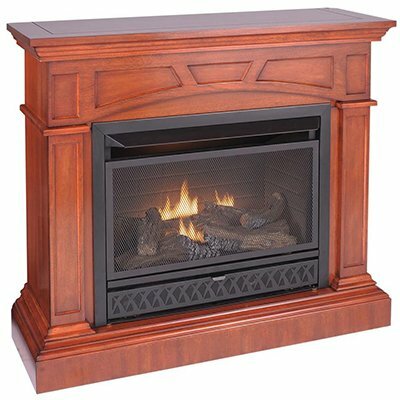 For our money, the Pleasant Hearth 46” Full Size Ventless Propane Gas Fireplace is our preference for the best propane gas fireplace on the market today. Boasting a heating capacity of 32,000 BTU’s, you’ll have more than enough heating capacity for a room as large as 1,100 sq. ft. That capacity can easily be controlled by a unique remote control that not only works as an on/off switch but can be used as a programmable thermostat – and you can even read the ambient temperature from the remote itself. That’s a big deal because you can accurately tell what the actual temp is from where you are in the room. Installation is trouble free as the sleek clearance design will let it sit just about anywhere you need in your living space, and the ventless operation means no chimney to deal with. In addition, a dual burner system adds more flames to get that real wood fire look. If you’re in the market for the best dual fuel gas insert you can find, then look no farther than the Duluth Forge Dual Fuel Vent Free Insert. Spruce up your existing fireplace with an efficient ventless propane gas insert that can produce up to 26,000 BTU’s – enough to warm a large 1,350 sq. ft. area! Dual fuel technology allows the unit to be operated with either natural gas or propane (for those that live in areas where natural gas may not be available). A remote control lets you operate all of the functions from across the room, including a piezo ignition system that eliminates the need for a pilot light that is constantly burning (saving you on fuel costs). Safe operation is a top concern with an integrated oxygen depletion sensor that will automatically shut the unit off if air quality degrades to an unsafe level. With the Napoleon Grandville VF Series fireplace, you get the best natural gas fireplace that we have come across…and we’ve looked at a lot! Flame and heat adjustments (up to 50% of overall flame height) are easily made with the included remote control, and with up to 30,000 BTU’s of heating capacity you will be able to heat the largest areas of your home. Visual effects are stunning as a dual flame burner system and Phazer® log set give you that “true wood fire” look and ambience. Worried about carbon monoxide when using a ventless unit? No need to be with this unit as an oxygen depletion sensor shuts the fireplace completely off when the amount of oxygen in the air drops below a safe level. So far all of our reviews have been geared towards units that are designed to be used within the home. Gas fireplaces/heaters aren’t limited to in-home applications, however. The best outdoor gas fireplace we have come across is the Bond Newcastle Propane Fishbowl. “Fishbowl”, you say? Yes! 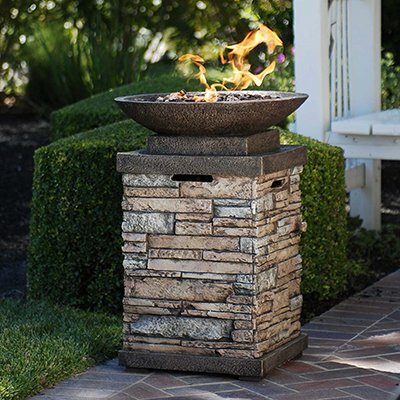 Breaking away from traditional thoughts of what a gas fireplace or heater can be, this unit is an extremely attractive way to add a little heat and atmosphere to your outdoor area. It’s perfect for those nights in early to late fall, allowing you to enjoy the outdoors for just a little bit longer before winter hits. The same could be said for springtime as well! Boasting an impressive 40,000 BTU capacity with a stainless steel burner (best to battle the elements and reduce corrosion), your patio or deck will have a sense of style unlike never before! The Fishbowl is conveniently fueled with standard 20 lb. tank that is stored within the base of the unit itself – that’s a big deal as it totally eliminates the need for running a dedicated gas line, and it also means you can place the unit anywhere you wish (still allowing for safe operation of course). A benefit of a gas fireplace is that they can accurately replicate the look of traditional wood burning options, be it an actual fireplace or a freestanding stove. The Pleasant Hearth Compact Vent-Free Gas Stove is right up your alley as the best freestanding gas fireplace on our list. This unit is designed for flexibility with having dual fuel capability (natural gas or propane). It also is geared more towards smaller spaces as it is rated to heat up to 700 sq. ft. That’s important as many gas units have a much larger heating area rating, so why would you pay extra for capacity that you may not need? Operation is easy thanks to a convenient thermostat control located at the base unit; there is no remote control capability, however. If you’re in the market for a unit with just the right amount of supplemental heat and that attractive “wood stove” look then this unit fits the bill. Our final review is for what we feel is the best small gas fireplace you can buy – the Pleasant Hearth 36” Compact Gas Fireplace. Designed for small heating areas, the 20,000 BTU rating will efficiently warm up to 700 sq. ft. with temperature adjustments easily controlled by a thermostat control knob. The rich wood finish looks great, and with two installation options (wall or corner) you can effectively place the unit to maximize your available floor space. 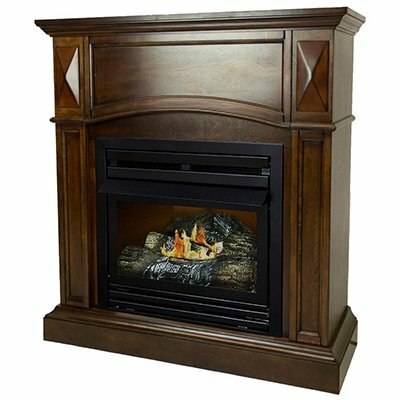 The dual burner system gives more flames to add to the realistic wood-fire effects, and the attractive mantel-style design adds just the right touch of class to any room. Elegance does not need to be exclusive only to larger, more expensive units. With this unit you can be guaranteed to have a visually appealing gas fireplace that will give you more than enough warmth during the winter season. While freestanding stove and wall mount styles are visually appealing and can provide more than enough heating capacity, a gas fireplace insert is really your best option if you want that “realistic” look in your house. The biggest requirement for these units, however, is that you currently have a fireplace as these, for the most part, drop right into the existing firebox. There are a few items that you need to take into account if you are considering an insert over a different style. Make sure that a gas line can be adequately run to the box (may be difficult depending on the construction of the fireplace). Also, will you be running a vented unit or ventless (differences between the two are explained below)? Each style has particular benefits with cost, energy efficiency, and visual appeal. Vented units are designed to operate with an existing chimney or flue, much in the way that a real wood fire does. This allows for gases (such as dangerous carbon monoxide) and soot (created by the combustion process) to be directed to the atmosphere outside of the home. The flame effects with a vented unit tend to be the most realistic as they are higher and have a yellow color as compared to the blue color more commonly associated with a gas flame. While they tend to be less expensive than a ventless unit, you also have the disadvantage of a portion of the heat going up the chimney. Gas fireplaces with ventless capability have the advantage of not needing any sort of chimney to vent outside. That may sound dangerous but they are designed to burn fuel extremely clean as to avoid any gases being distributed into the room. Since there is no airflow to the outside all of the heat generated stays inside, adding to the overall energy efficiency. That being said, there are naturally some levels of combustion by-products that will be forced into the room; for this reason, some states (California) and countries (Canada) do not allow installation whatsoever. However, ventless units tend to have less realistic flame effects and are usually more expensive to purchase initially. There also is a tendency to add humidity to the atmosphere inside the room as well. One huge benefit over electric operation is that no electricity is needed – the perfect answer for keeping your home warm if the power ever goes out. The amount of BTU’s needed to properly heat a given area can vary based on a number of factors. The age and type of construction of the house coupled with the overall climate can make number of BTU’s per square foot range from 30 to 60. A good rule of thumb is to aim in the middle with a target of around 45 BTU/sq. ft. Remember, this is just a general estimate so take your individual home factors into consideration. First and foremost, have the unit installed by a professional. Natural gas and propane are not usually handled by a typical DIY’er. For vented units, make sure that the chimney is properly cleaned. Gas may not burn as dirty as wood, but there are still combustion by-products that can accumulate over time. Always install a carbon monoxide detector; a simple unit that plugs into a standard wall outlet will be good enough. Carbon dioxide is odorless and tasteless so you have no way of knowing if it may be building up in your living space. Make sure that all safety systems (FSD’s and ASD’s) are operating properly. How do gas fireplaces work? Any gas fireplace is fueled by either natural gas or propane instead of wood fuel or electricity. A dedicated gas line (installed by a trained professional) must be routed to the unit, and the gas supply is normally left on at all times so the unit’s pilot light stays burning (similar to that of a gas-based water heater). Temperature control is achieved by adjusting the amount of gas delivered to the burner unit. 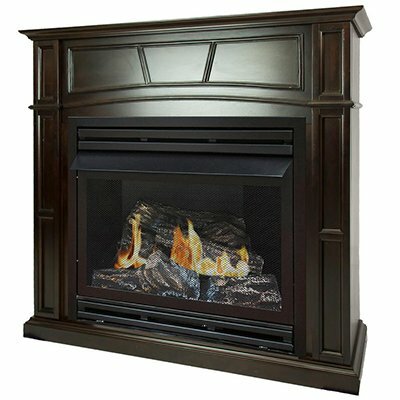 How do gas fireplace inserts work? All gas fireplaces – including inserts – operate using the same methods. 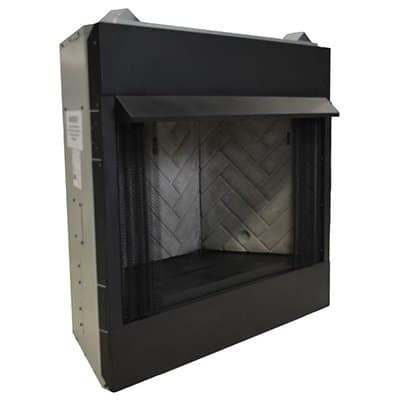 Inserts are unique in that they are designed to be installed within an existing fireplace firebox as an efficient option over a traditional wood fire. Will my existing fireplace be compatible with an insert? In theory, yes. All an insert does is take up the space in your existing firebox and allows you to have a gas fire instead of a wood fire. The units are designed for easy installation across most units but there may be cases where a professional may be needed to make sure the unit is seated properly within the fireplace. Are gas powered heaters environmentally friendly? All gas fireplaces are much more environmentally friendly when compared to a wood fueled unit. Wood combustion generates many dangerous gases and compounds that must be sent into the atmosphere to ensure safe operation within the home. Gas combustion, while not as completely clean as electric heat, is much cleaner than wood burning fires. 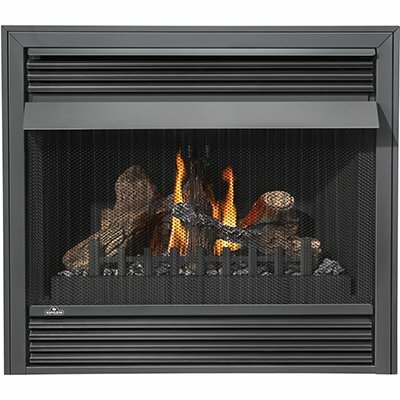 Can you convert a fireplace to a gas outlet? In almost all cases, yes. It is simply a manner of properly running a gas line to firebox where the insert or gas log set can be installed and fueled properly. Do you need a professional contractor to install these heaters? Yes – without a doubt. Gas line installation absolutely requires a trained professional for in order to make sure it is up to code and – most importantly – ensure safe operation. Even a small leak can be extremely dangerous. On top of that, any vented unit must be properly vented to the outside to avoid accumulation of combustion gases in the home. It doesn’t. Don’t even ask. See above for reasons why! The safety concerns are much too important to try and do it yourself just to save a few bucks. Get it done properly! While it may be tempting to do so, it is not recommended. Any supplemental heating source – be it gas, electric, or wood – creates a potential hazard in the home that should be attended at all times. Attractive, stylish, and energy efficient, a gas fireplace can be exactly the right solution for having an effective zone heating strategy for your home. The combination of features such as a large heating capacity, clean burning, and effective temperature control (as found in the Emberglow Vent-Free Dual Fuel Fireplace) makes these units the right choice for many homeowners. Take the chill out of the air this winter with one our best gas fireplaces – your family and your heating budget will thank you for it!